I had the pleasure of doing several segments on Yahoo Finance Daily Ticker on the slowing global economy with Aaron Task and Henry Blodget. This month marks the two-year anniversary of the "recovery" that began in June 2009. But you can easily be forgiven if you haven't noticed. Because this recovery doesn't feel like a recovery--in part because it isn't much of a recovery. Normally, after a recession of the depth and length of the one we had in 2008 and 2009, the economy comes roaring back with GDP growth of 5%-7% for a couple of years. In the latest recovery, we've only had one quarter that exceeded 5%, and the growth last quarter was a pathetic 1.8%. The jobs market, meanwhile, remains weak, with unemployment still at a staggering 9%. Corporate profits are hitting all-time highs, which is helping the stock market, but these profits haven't translated into new hiring. House prices continue to fall. Wage growth is stagnant. Inflation is picking up. Oil is now back over $100 per barrel. Our debt burden is still massive. And our government is still running shocking deficits of ~$1.5 trillion per year. And the rest of the world is experiencing pretty much the same thing. Put it all together, says Mike "Mish" Shedlock, an advisor at Sitka Pacific Capital and the author of Mish's Global Economic Trend Analysis, and you can draw only one conclusion: The economy's weak and getting weaker. Mish, in fact, thinks we may be headed for another recession. The above video was recorded yesterday, well in advance of the just released Manufacturing ISM numbers. If the video does not play, please click on the preceding link. 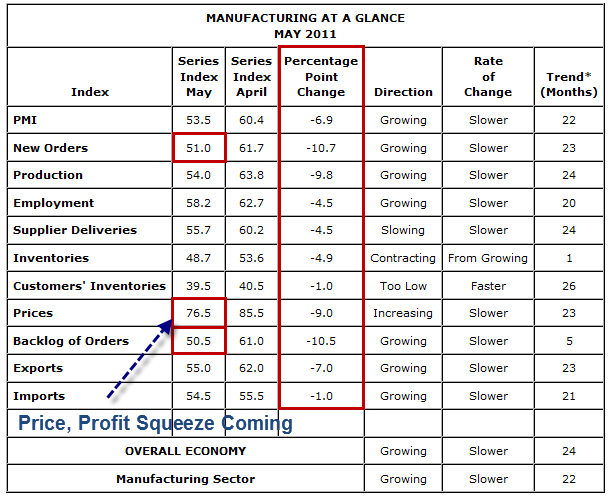 "The PMI registered 53.5 percent and indicates expansion in the manufacturing sector for the 22nd consecutive month. This month's index, however, registered 6.9 percentage points below the April reading of 60.4 percent, and is the first reading below 60 percent for 2011, as well as the lowest PMI reported for the past 12 months. 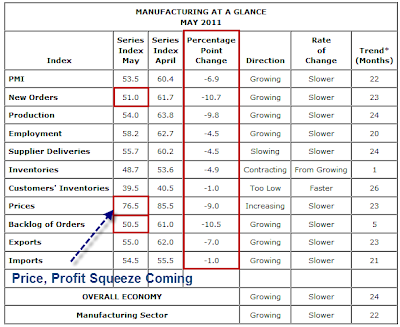 Slower growth in new orders and production are the primary contributors to this month's lower PMI reading. Manufacturing employment continues to show good momentum for the year, as the Employment Index registered 58.2 percent, which is 4.5 percentage points lower than the 62.7 percent reported in April. Manufacturers continue to experience significant cost pressures from commodities and other inputs." Prices plunged this month along with everything else. However, prices are well above contraction. Orders on the other hand are barely above contraction. Either commodity prices plunge, or manufacturers get hit in a price and profit squeeze with falling customer demand. Which will happen? I think both. That was the first of three videos. The second video was a discussion on the debt ceiling. Please consider Debt Ceiling Discussion on Daily Ticker with Mish, Aaron Task, Henry Blodget: Will the Bond Market Eventually Force Congressional Hands? The third Yahoo Finance video was on deflation and gold. Please see Why I Continue to Like Gold for a discussion.